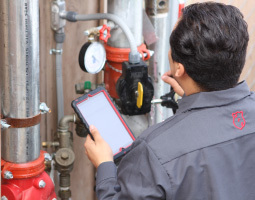 At Aztec Fire & Safety, our number one concern is using innovations and technologies to protect lives and property in Escondido CA. Since 1996, our fire protection systems & services have helped ensure your neighbors in Escondido, CA are compliant with fire and life safety codes. Nice dealing with Cody, knowledgeable and professional. Very professional. Explained the process and all the safety features that are provided. Portable Extinguishers Service Call Service Call: Please service/tag (2) extinguishers and (1) paint booth. Called in by Terik and confirmed with Sana. Portable Extinguishers Service Call Service Call: Please install (1) 5 lbs Fire Extinguisher in the warehouse. Called in by Monique. Alarm Systems Inspection Annual Fire Alarm Inspection Deficiency for Notifier SFP Series 1090 Building: Need to add smoke above panel in building (1090), Panel is in constant battery supervisor in after battery replaced with new, loose wire behind panel, makes panel normal and then into ground fault if moved around. Suggested to replace panel with all new devices, units have mini horns inside of them. Did not test to make sure all floors work correctly, panel was not tagged with current tag on panel. VDC on Panel is 25.5 battery’s brand new Building has (6) manual pull stations and (1) trouble device on first floor. Every unit has a mini horn, (6) heat sectors (2) per floor. (44) units inside building 1090 Deficiency for Notifier SGL-404 1080 Building: Need to add smoke above panel in building 1080, need access to every unit to verify all mini horns are working. First floor fire door does not shut all the way, Need to address ASAP. Panel is in normal condition when done testing. Portable Extinguishers Service Call Service Call: Please deliver 10-12 FE covers to the office. Called in by Michelle (916) 500-8414. Portable Extinguishers Service Call Service Call: Please refill 3 fire extinguishers (per/lbs + trip charge). Called in by Michelle (760) 746-6001.